A family in Commerce City, Colorado was awarded nearly $1 in damages as the result of a lawsuit brought against AquaKleen, a large water treatment company known for its high dollar product line and its aggressive marketing style. The treatment system in question was a water softener. The family had complained repeatedly of foul tasting water after the softener’s 2006 installation. In each instance, SafetyKleen assured them that their water had been tested and that everything was fine. The source of the bad tasting water was finally discovered by a plumber to be a direct connection of the softener’s drain into a sewer pipe, allowing sewage to be sucked into the softener and from there to the family’s drinking water. A short time after the installation, a member of the family was diagnosed with Crohn’s disease, which, doctors said, resulted from drinking the contaminated water. Subsequent inspection by safety officials found all 58 of SafetyKleen’s installations that were inspected in the area were improperly installed, and 20 of these had cross connections with a sewer pipe. 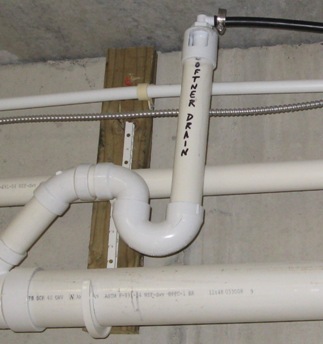 Proper installation of a softener or other water treatment device into a waste water line involves use of an “air gap” device like the one above. The air gap provides an air space to prevent back siphoning. More Details about the SafetyKleen in Colorado.